Chen, Q., Endo, T., and Wang, Q. (2016). "Characterization of microcrystalline cellulose after pretreatment with low concentrations of ionic liquid-H2O for a pyrolysis process," BioRes. 11(1), 159-173. Microcrystalline cellulose (MCC) samples pretreated by ionic liquid (ILs)-H2O mixtures were studied for application in a pyrolysis process. A 1-ethyl-3-methylimidazolium methanesulfonate [Emim][MeSO3]-H2O mixture with solid acid catalyst Nafion®NR50 was used in the pretreatment process. A lower amount of hydrogen bonding between neighboring pretreated MCC chains resulted from a less ordered cellulose structure, leading to lower crystallinity, decreased molecular weight and reduced thermal stability. The pyrolysis result showed that the yields of char were lower, the average reaction rate increased, and the DTG peak temperature decreased relative to the untreated MCC. The amount and concentration of the hydrogen gas obtained from the pyrolysis of sample 90(20) (4.00 mmol/g-sample) was higher than that obtained from the pyrolysis of the MCC (3.26 mmol/g-sample). This study explores MCC (pretreated by ionic liquid-H2O mixtures) with a recyclable solid acid catalyst under varying pretreatment conditions, as a potential raw feed material, to be applied in the pyrolysis process. Cellulose, as an abundant raw material consisting of renewable polysaccharides, can enter the biorefinery for the production of an array of products, including transportation fuels and other products, to meet world energy needs. Cellulose is a high molecular weight linear-polymer composed of D-glucopyranose units linked by β-1,4-glycosidic bonds. Three hydroxyl groups are able to interact with one another forming intramolecular (O3′-H…O5; O2-H…O6′) and intermolecular (O6′-H…O3) hydrogen bonds in each of the glucopyranose units. Cellulose does not dissolve in water or in some aprotic solvents such as alcohols and amines. Some solvents including lithium chloride/dimethylacetamide (LiCl/DMAc), N-methylmorpholine-N-oxide monohydrate aqueous solutions, and metal complexes (NMMO) that were applied in the study of dissolving cellulose and cellulose derivatives suffer from toxicity, recycling problems, and thermal instability (Olivier-Bourbigou et al. 2010). Since Swatloski et al. (2002) reported that cellulose could dissolve in ionic liquid, many studies had been focused on the subject of lignocellulosic biomass conversion. The search for new ILs for dissolving and processing cellulose has attracted increasing attention (Pinkert et al. 2009; Gericke et al. 2013). The chemical and physical pretreatment of biomass resources is a field of growing interest and practicality (Mosier et al. 2005). The pretreatment of cellulose materials can affect their physical properties such as crystallinity, surface structure and area, and degree of polymerization. These changes, such as enzymatic hydrolysis can affect their subsequent utilization (Brandt et al. 2013). Recently, ionic liquid-H2O (IL-H2O) pretreatment methods have been of considerable interest, and pretreated samples have been used in subsequent applications, such as saccharification or enzymatic dehydrogenation (Sun et al. 2009; Li et al. 2010). Adding water or other organic solvents to IL systems can reduce the processing cost significantly and allow the large-scale treatment of cellulose. The effect of pH value (Zhang et al. 2013), particle size (Bahcegul et al. 2012; Hou et al. 2013), water content, pretreatment time, and other influencing factors (Brandt et al. 2011) have been investigated based on lignocellulosic biomass research. Generally, the more water in an IL-H2O mixture system, the less the concentration of cellulose in the solution (Mazza et al. 2009), due to the water molecules binding to two anions by hydrogen bonds (López-Pastor et al. 2006). Thus, it appears to be difficult to achieve the total dissolution of biomass in an IL-H2O mixture. The pyrolysis process is a thermochemical reaction method used in developing clean energy. Products of pyrolysis have been investigated as a substitute for fossil resources. Pyrolysis refers to the thermal decomposition of a material to form some combination of gaseous products (e.g., H2, CO, CO2, CH4 and hydrocarbons), liquids (tar and water), and solids (char) (Yang et al. 2006). Approaches for biomass conversion that involve pyrolysis include fast pyrolysis, gasification, and catalytic fast pyrolysis. The proposed methods for transforming biomass into useful products are the microbial fermentation method, saccharification of the glucose and other carbohydrates, and thermo-chemical conversion of the lignocellulose biomass by a pyrolysis or gasification process. One important tool in reducing the cost of this depolymerization is the pretreatment of the lignocellulosics to make the biomass matrix more accessible to these applications. As an important pretreatment method, pretreatment of lignocellulosic materials by an IL-H2O mixture has recently generated much interest (Chen et al. 2015). This study explores the significance of ionic liquids as pretreatment solvents with water and a recyclable solid acid catalyst. As a possible mechanism it is suggested that the water hydrogen-bonds strongly to the ionic liquid’s anion, so reducing its propensity to interact with the cellulose. It also prevents the coordination of ionic liquid anions to the cellulose. The anion from ILs were released due to the ion-exchange with the sulfonate (SO3H) groups, meanwhile, the released H+ from solid acid which interacting with the hydroxyl group of cellulose. After the pretreatment process, the pretreated microcrystalline cellulose (MCC), as a potential raw feed material, was applied in the pyrolysis process with a focus on the pyrolysis kinetics and gaseous products. 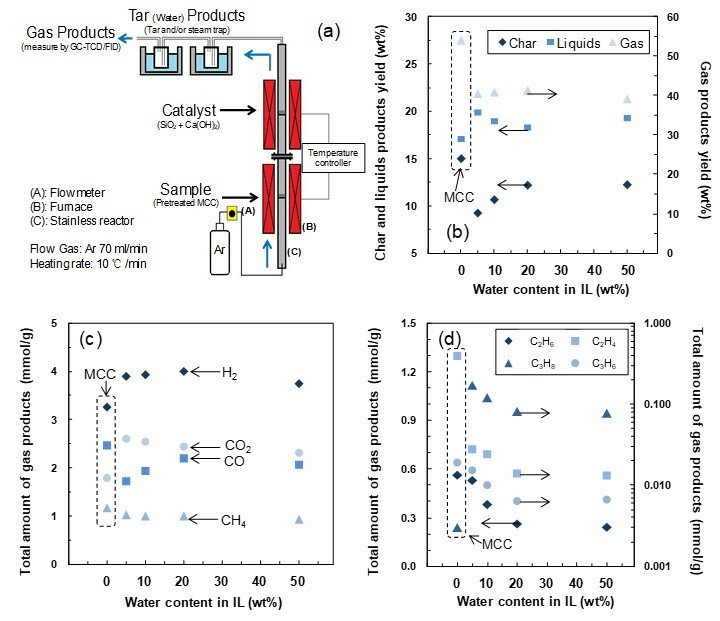 In addition, the characterization of MCC in a crystalline structure or a decomposition rate effect on the cellulose pyrolysis process could be expected due to a quantitative assessment of the IL-H2O mixture pretreatment system. The 1-ethyl 3-methylimidazolium methylsulfonate [Emim][MeSO3]- H2O mixtures have been investigated as green solvents for the pretreatment process (Heym et al. 2011). The use of macroreticulated styrene-divinylbenzene resins functionalized with sulfonic groups to catalyze the hydrolysis has been previously reported (Rinaldi et al. 2008). The solid acid catalyst Nafion®NR50 with good thermal stability was loaded in the IL-H2O mixture system to promote a more efficient pretreatment process in a lower concentration ionic liquid at a lower reaction temperature for economic reasons. In this work, the MCC pretreated under different conditions was characterized by X-ray diffraction (XRD), Fourier transform infrared spectroscopy (FTIR), gel permeation chromatography (GPC), and scanning electron microscopy (SEM) for extensive structural feature determination. Thermogravimetric and differential thermal analysis (TG-DTA) was employed to understand the relative changes in the pyrolysis rate and solid product. The gaseous products were determined by a gas chromatograph equipped with a thermal conduct detector (GC-TCD) and a gas chromatograph equipped with a flame ionization detector (GC-FID). This study could play a role as a bridge a gap in the pretreatment process of pyrolysis for operational applications. Microcrystalline cellulose (MCC, ca. 0.05 mm) samples were supplied by SERVA Electrophoresis GmbH (Germany). The MCC was further dried in a vacuum oven at 105 °C to eliminate the moisture content. The proximate analysis of the MCC was carried out based on the JIS-M8812 standard and it resulted in moisture, volatile matter, fixed carbon and ash contents of 7.2, 86.9, 5.9 and 0.0 wt. %, respectively. The total 43.3 wt.% C, 50.46 wt.% O, 6.2 wt.% H, and 0.0 wt.% N concentrations were determined using a CHN coder (Yanagimoto MT-5) based on JIS-M8813. The ionic liquid 1-ethyl-3-methylimidazolium methanesulfonate ([Emim][MeSO3], C7H14N2O3S, purity ≥95%; impurities ≤0.5% water) is a product of BASF and was supplied by Sigma-Aldrich (USA). The solid acid catalyst Nafion®NR50 (NR50, ≥0.8 meq/g ion exchange capacity) supplied by Sigma-Aldrich (USA). All other chemicals were reagent grade, purchased from Wako Pure Chemical Industries (Japan) and used without further purification. MCC powder was loaded into a flask, and then the selected ionic liquid, [Emim][MeSO3], deionized water, and NR50 were added (mass ratio of MCC sample to ionic liquid, H2O, and solid acid catalyst was 1 : 5 : (0.25, 0.5, 1, 2.5, and 5) : 0.5) at 90, 120, and 150 °C for 60 min. The flask was heated and stirred while immersed in an oil bath. The pretreated samples were washed with methanol and deionized water to remove the ionic liquid mixtures. The solid acid catalyst NR50, with a larger granule size than the MCC powder particle size, was removed by manual separation. The pretreated MCC samples were dried in a vacuum oven at 105 °C for 24 h for subsequent analysis and pyrolysis experiments. The X-ray diffraction (XRD) experiments were performed on an Ultima III X-Ray diffractometer (Rigaku Co. Ltd., Japan). Ni-filtered Cu K α radiation (λ=0.1542 nm) was generated from 40 kV voltage and 40 mA current. The range of intensities was from 10° to 40° with a 2°/min scan speed. The crystallinity index (Cr.I.) was determined by the Segal method (Wada et al. 2001). where I002 is the height of the 002 peak and Iam is the height of the minimum between the 002 and the 101 peaks. where λ is the X-ray wavelength (0.1542 nm), and θ is the Bragg angle corresponding to the (002) plane. The pretreated MCC was analyzed by a Fourier transform infrared spectroscope (FTIR, Model IR-6100, Jasco Co. Ltd., Japan). The ratio of the samples to spectroscopic grade KBr was 1:100; all of the infrared spectra were recorded in absorbance units within the range of 4000 to 400 cm-1. The nitrocellulose was dissolved in tetrahydrofuran (THF) to evaluate the average molecular weight. The molecular weight distribution was determined by a gel permeation chromatography system equipped with KF-G and KD806L gel columns (Shodex, Showa Denko K.K. Co. Ltd., Japan) and nitrocellulose with a ratio of 0.1% (w/v) and filtered through a 0.45 μm membrane. The surface morphological changes of MCC and pretreated samples were observed by a scanning electron microscope (SEM, Model S-2400, Hitachi Co. Ltd., Japan) under an acceleration voltage of 15kV. The pyrolysis experiments were performed in a vertical tubular fixed-bed reactor. The temperature was measured by a thermocouple inside the bed. In each experiment, unless otherwise noted, 1.0 g samples were placed into the bottom of the reactor, and 5.0 g mixed SiO2/Ca(OH)2 catalyst was placed into the top of the reactor at 800 °C. The experiment was carried out with a heating rate of 10 K/min, and the samples were heated from room temperature to 900 °C under argon gas with a flow rate of 70 mL/min. The liquid phase consisted of oil and water phases that were separated and weighed. The four major gases, including H2, CO, CH4, and CO2, were measured by a gas chromatograph equipped with a thermal conduct detector (GC-TCD, Model GC-2014, Shimadzu Co. Ltd., Japan). The hydrocarbon gases, including C2H6, C2H4, C3H8, and C3H6 were analyzed on a gas chromatograph equipped with a flame ionization detector (GC-FID, Model GC-2010, Shimadzu Co. Ltd., Japan). The char yields were calculated by thermogravimetric and differential thermal analysis (TG-DTA) (Model DTG-60, Shimadzu Co. Ltd., Japan). Approximately 10 mg of the sample was placed on the scale in the apparatus, and the sample was heated up to 900 °C under an Ar atmosphere. where α is the conversion degree, T is the rate constant dependent on the pyrolysis temperature, and f(α) is a conversion function dependent on the pyrolysis reaction mechanism. where m0 is the initial weight of the sample, m is the weight of the sample at time t, and m∞ is the final weight of the sample. where n=1 is the reaction order in this study as Eq. 7. Thus, a plot of ln[-ln(1-α)/T2] against 1/T is a straight line with slope (-E/R) and intercept (ln[AR/βE]), and the kinetic parameters were determined based on it. This paper focuses on the characterization of the MCC pretreated by [Emim][MeSO3]-H2O mixtures with solid acid catalyst Nafion®NR50 ([E]-H2O-NR50 mixtures), and the pretreated microcrystalline cellulose (MCC) samples (where the sample code 90(20) indicates a ratio of H2O to IL set to 1:5 (20 wt%) at 90 °C) were subjected to a pyrolysis process with a focus on measuring the pyrolysis kinetics and gaseous products. The weight losses of all the pretreated MCC specimens were less than 10 wt%, and there were no gelation products in the pretreated samples. Common methods for the characterization of the crystalline cellulose structure are based on XRD and FTIR. The crystallinity index (Cr.I) was calculated from XRD curves by the height ratio between the intensity of the crystalline peak and the total intensity. 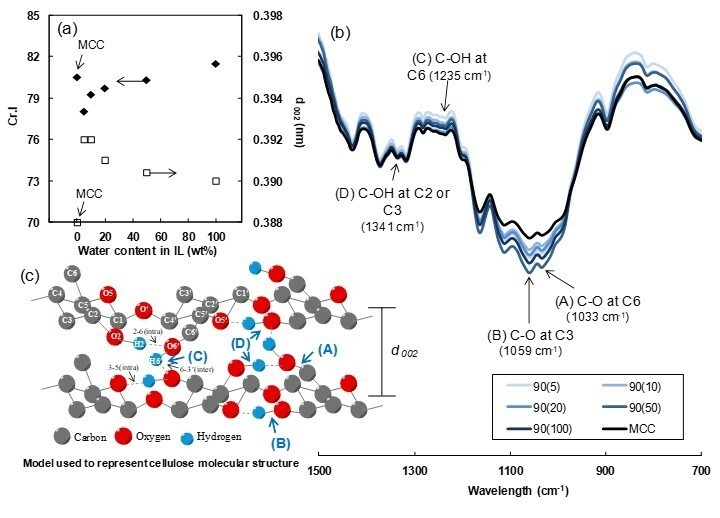 FTIR absorption gave some useful information related to the change of the hydrogen bonding during the crystal transformation during the IL-H2O pretreatment process. In the pretreatment experiment, the mass ratio of the MCC powder to [Emim][MeSO3], H2O and solid acid catalyst was set to 1 : 5 : (0.25, 0.5, 1, 2.5, and 5) : 0.5 at 90, 120, and 150 °C for 60 min. Then, the pretreated MCC was filtered and dried under vacuum for subsequent analysis and utilization. The XRD patterns of the pretreated MCC in [E]-H2O-NR50 mixtures at 90 and 150 °C are shown in Fig. 1(a) and (b). The characterized crystalline structure, the change in the FTIR absorption, and the hydrogen bonding of the glucose units in cellulose are shown in Fig. 2(a) and (b) to elucidate the effect of the [E]-H2O-NR50 mixtures on the MCC intrachain and interchain hydrogen bonding in ordered regions of the structure. The model in Fig. 2(c) represents the cellulose chains, showing the MCC structure and d-spacings of the 002 plane (d002). There was no transition from cellulose I to II under each experiment condition in this study. Therefore, no cellulose derivative was produced for subsequent utilization in these cases. Measurement of cellulose Cr.I by the XRD patterns provides a qualitative analysis of the amounts of amorphous cellulose and crystalline cellulose components in a pretreated sample. A clear shallow shoulder peak suggested that the arrangement of the cellulose chains was disturbed within the hydrogen-bonded sheets under each pretreatment temperature in Fig. 1(a) and (b). Meanwhile, the result of Cr.I clearly showed the change in the crystalline structure in pretreated MCC. The result of Cr.I ranged from 81 for sample 90(100) to 78 for sample 90(5) samples. Fig. 1. X-ray diffractograms of pretreated MCC and untreated MCC at pretreatment temperatures of 90 °C (a) and 150 °C (b). A simple height comparison could be expected to provide a reasonable estimate of the pretreated cellulose crystallinity parameters. However, variations in peak width also provide data on the crystallite size and/or d-spacing of the crystallites in MCC (Park et al. 2010). The d-spacing of the MCC samples pretreated at 90 °C calculated from the XRD profiles can be seen in Fig. 2(a). The results of d002 were 0.388 (nm) for MCC and 0.392, 0.392, 0.391, 0.390, 0.390 (nm) for samples 90(5), 90(10), 90(20), 90(50), and 90(100), respectively. The increase in the average d002 suggested that the pretreated MCC contained a looser cellulose structure than does the untreated MCC. Two major reasons may explain this behavior. The amorphous part of the cellulose was dissolved in the [E]-H2O-NR50 mixtures, as observed in the Cr.I of sample 90(100), 81, which was higher than that of the untreated MCC samples. Meanwhile, it was reported that the pretreated MCC was distorted and transformed into a less-ordered intermediate structure, also a reflection Cr.I result (Cheng et al. 2012). The intrachain and interchain hydrogen bonding might have been disrupted by the [E]-H2O-NR50 mixtures (Zhang et al. 2014). However, the hydrogen bonding forces became weaker than in the untreated MCC as a result of the pretreatment process could not be confirmed only by the XRD result. The FTIR absorption data used to support the change in the hydrogen bonding in the pretreated MCC can be seen in Fig. 2(b). The band at 1033 cm-1 is assigned as the CO at C-6, and the band at 1059 cm-1 is assigned as the CO at C-3 (Kačuráková et al. 2002). Both of the bands exhibited increases in absorbance. This result indicated that the intrachain and interchain hydrogen bonding changed. The bands at 1235 cm-1 assigned as the in plane C-OH at C6 decreased. The bands at 1337 cm-1 assigned as the in plane C-OH at C2 and C3 also decreased and shifted to 1341 cm-1 (Colom and Carillo 2002). The changes in hydrogen bonding led to an improved intermolecular force environment in the pretreated MCC. As a result, a looser crystalline structure was formed in the pretreated MCC. Previous solid acid catalyst studies provided insight into the mechanism of the release of protons from solid acid resin in an IL system (Dwiatmoko et al. 2010), explaining that a portion is released by ion-exchange with the cation of the IL, which could enhance the hydrolysis activity (Kim et al. 2010). This result suggests that the intrachain and interchain hydrogen bonding was disrupted by the released portion and the anion of the IL from the [E]-H2O-NR50 mixture system. Therefore, the smaller the water concentration in the [E]-H2O-NR50 mixture, the lower the Cr.I results of the pretreated MCC that was obtained. It was confirmed that a looser cellulose crystalline structure was formed. The surface structure of the MCC samples pretreated at 90 °C, 120 °C, and 150 °C was carefully observed by SEM in Fig. 3. Two main changes can be concluded. First, the amount of irregularly shaped cellulose particles decreased. Second, a visual trend is shown in the SEM results in Fig. 3(b1), (c1) and (d1), where the MCC samples pretreated with [E]-H2O-NR50 mixtures showed obvious cracks on their surfaces leading to an increase in the surface area of the pretreated MCC. However, there were no obvious differences between the different pretreatment temperatures. The changes in crystallinity, d002 plane and surface structure were found to severely affect the thermal stability of the cellulose (Poletto et al. 2012). The GPC result showed that the average molecular weight decreased after pretreatment (see sample 90(100)), as shown in Fig. 4(a). However, the average molecular weight increased with the increasing concentrations of the ionic liquid. In the other words, the lower molecular weight part of the MCC more easily dissolved in the mixture system (Wang et al. 2014). The average molecular weight decreased with the increasing pretreatment temperature, as shown in Fig. 4(b). Therefore, the manner in which the pretreated cellulose affects the pyrolysis process, char yield and gaseous products is equally interesting. The char yields obtained from pyrolysis of pretreated MCC at 900 °C and the DTGmax values calculated from the TG curve are shown in Fig. 5(a). The kinetic parameters for MCC pyrolysis are shown in Fig. 5(b) and reflect the degradation of the total pretreated sample under different pretreatment conditions. The purpose of this study was that the IL-H2O mixture pretreated MCC be subjected to a pyrolysis process. For lignocellulosic biomass, cellulose mainly contributes to the liquid and gas yields. In this study, a mixed SiO2+Ca(OH)2 catalyst was used to transform the intermediate product into gaseous products. Figure 6(a) shows that the char yields obtained from the pretreated samples at 900 °C were significantly decreased compared to that from the untreated MCC. This indicates that greater liquids yield and/or gas yields could be obtained. The amount of char yield was different in samples such as 90(5) and 150(5), which were pretreated in higher concentrations of ILs. Once again, the crystallinity index, crystallite size and surface structure can affect the thermal stability of the cellulose. Therefore, this result indicated that no variation in the crystallinity structure occurred in samples pretreated with an excess amount of water i.e., sample 90(50) and sample 90(100)). The effect of the [E]-H2O-NR50 mixture systems on MCC was limited due to the excess amount of water, even at a higher pretreatment temperature (i.e., sample 150(100)). The DTGmax value increased when less water was loaded in the [E]-H2O-NR50 mixtures system. From the slope of Eq (12), the apparent activation energy can be calculated, as is shown in Fig. 5(b). The temperature showed an approximately linear increase with a heating rate of 10 °C / min under argon gas in the range of 280 to 380 °C for pyrolysis. The activation energy had high linear coefficients of determination (R2) in the range from 0.9516 to 0.9586. The average values of the activation energy for the pyrolysis varied slightly. The average activation energy values obtained for pyrolysis of samples 90(5), 90(10), 90(20), 90(50), and 90(100) were 53.9, 58.8, 59.1, 57.3, and 58.7 kJ/mol, respectively. The value of the activation energy obtained in the pyrolysis of pretreated MCC samples at different pretreatment temperatures were in a similar range. A lower activation energy (39.2 kJ/mol) was observed in untreated MCC. These result indicated that the decrease of the char yield was correlated with higher activation energy. The higher activation energy calculated for the pretreated MCC pyrolysis could therefore be associated with the lower char formation (Cho et al. 2010). The TG curves of the MCC and 90(5)-90(100) samples that differed in the ratio of the water content to the ionic liquid are shown in Fig. 6(a). The DTG curves of the 90(5)-90(100) samples are plotted in Fig. 6(b), which was used to compare the degradation rate of the pretreated MCC. With the temperature increasing further, the TG profile of the pretreated MCC showed an obvious peak. The DTG peak of the pretreated MCC was lower than that of the untreated MCC. Poletto et al. (2012) reported that the thermal decomposition of cellulose shifted to higher temperatures due to the increasing crystallinity index and crystallite size in a biomass sample case. In this study, the results showed that the thermal decomposition of pretreated MCC was shifted to lower temperatures with the decreasing crystallinity index. A higher DTGmax result of cellulose was also obtained. On the other hand, the crystallinity index was not only related to the degradation rate of the pretreated MCC but also to the thermal decomposition temperature. A lower amount of hydrogen bonding between neighboring cellulose chains results from a looser cellulose crystalline structure, which can lead to a lower crystallinity index and thermal stability. Zickler et al. (2007) also reported that the thermal decomposition of cellulose is mainly via a thermally activated decrease of the cellulose diameter. The laboratory experimental methods used in this study are shown in Fig. 7(a). The total amounts of collected char, liquid, and gas products are shown in Fig. 7(b). The most common mechanism for cellulose pyrolysis is that the initial reaction is an induction or activation step, the intermediate product of which is defined as active cellulose (Banyasz et al. 2001). After this process, the intermediate product is decomposed by a pair of competing pathways. One of these reactions produces a liquid product (of tar and water), and the other generates char and gas products. The formation of char becomes a dominant reaction path depending on heating rates and temperatures (Yang et al. 2006). In this study, the pretreated MCC tends to release lower gas products and char products. However, sample 90(20) showed that the mixed SiO2+Ca(OH)2 catalyst could transfer more intermediate product into the gas product. Therefore, the composition of the main pyrolysis products might significantly relate to the sample physical-chemical characteristics. Fig. 7. The experimental procedure of the pyrolysis device system (a), the overall distribution of char, liquid and gas products obtained from the pyrolysis of MCC (b), total amount of main gas product obtained from the pyrolysis of MCC, pretreated sample (c), total amount of hydrocarbon products (d). The pyrolysis of the samples was carried out using the heating rate of 10 °C / min under argon gas. The pyrolysis process was in a range from 180 to 900 °C. The measurement of gas products was carried out every 80 °C. The gas species distributions were quite similar for the cases of loading mixed SiO2+Ca(OH)2 as the catalyst. The total yields of H2, CO, CH4, and CO2 calculated at 900 °C are shown in Fig. 7(c). Some hydrocarbons (C2H6, C2H4, C3H8 and C3H6) are shown in Fig. 7(d). The gas product from sample 90(20) contained 3.995 mmol/g(sample) of H2, 2.192 mmol/g(sample) of CO, 0.997 mmol/g(sample) of CH4, and 2.436 mmol/g(sample) of CO2. The gas product from the unpretreated MCC contained 3.256 mmol/g(sample) of H2, 4.924 mmol/g(sample) of CO, 1.168 mmol/g(sample) of CH4, and 1.785 mmol/g(sample) of CO2. The changing trend of the H2 concentration can reflect the extent of the secondary reactions (Dai et al. 2000). No more H2 gas was observed at a higher temperature (＞500°C). Therefore, the greater H2 generation could be related to the pretreatment process, while the yield of CO gas obtained from the pretreated samples was decreased. The CO2 content increased as the hydrocarbons decreased, including CH4. This might have been caused by different operating conditions and the sample physical-chemical characteristics (Scott et al. 1988). In addition, the pretreated MCC subjected to a pyrolysis process at different temperatures are listed in Table. 1. It was found that the yield of the H2 gas obtained from the pretreated sample was higher than that from the untreated MCC. Overall, the pretreatment process was studied with respect to their products being subjected to a pyrolysis process. Thus, the relevance of the pretreatment process and pyrolysis process should be considered. First, the intrachain and interchain hydrogen bonding was disrupted by [E]-H2O-NR50 mixtures. The disordered crystalline structure led to a decreased amount of Cr.I, and weaker hydrogen bonding forces in the cellulose crystallite structure. This resulted from a looser cellulose structure, which led to lower crystallinity and thermal stability, as observed in all pretreated MCC samples. Second, the higher activation energy confirmed in the pretreated MCC could be associated with the lower char formation. As a result, more active cellulose should be formed. However, the total amount of gaseous products also decreased. Therefore, the liquid products should be important for future study. Third, hydrogen-rich gas was obtained from the pyrolysis of pretreated MCC, as observed in all pretreated MCC samples including the pretreated MCC using the low concentration IL-H2O mixture systems. Therefore, a low water content in IL-H2O mixtures for MCC pretreatment might not be a necessary condition for the pyrolysis process. In this work, microcrystalline cellulose (MCC) samples pretreated by [Emim][MeSO3]-H2O mixtures with the solid acid catalyst Nafion®NR50 were studied for their application in a pyrolysis process. A lower amount of hydrogen bonding between neighboring cellulose chains resulting from a looser cellulose crystalline structure could lead to a lower crystallinity index and thermal stability. The higher activation energy calculated from the pretreated MCC pyrolysis could be associated with the lower char formation. The amount of hydrogen gas obtained from the pyrolysis of the pretreated sample was higher than that of the MCC, while the yield of char was decreased. The research was supported by the special funds for Basic Researches (B) (No. 22303022) of Grant-in-Aid Scientific Research of the Japanese Ministry of Education, Culture, Sports, Science and Technology (MEXT), Japan. 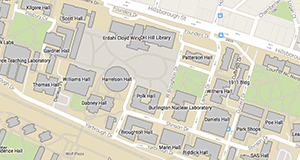 Park, S., Baker1, J. O., Himmel1, M. E., Parilla, P. A., and Johnson, D. K. (2010). “Cellulose crystallinity index: Measurement techniques and their impact on interpreting cellulase performance,” Biotechnol. Biofuels. 3(10). Article submitted: July 23, 2015; Peer review completed: September 20, 2015; Revised version received and accepted; September 27, 2015; Published: November 10, 2015.